Today i have a very beautiful polish to show you along with the challenge manicure. Opi In The Cable Car-Pool Lane is a part of Opi San Fransisco Collection. It is a deep burgundy polish with almost jelly finish, more accurately its a crelly formula. Initially i wasn't sure how it will look on me but I got it any way because i wanted to try this kinda shade. I used two coats for following pictures without top coat. I dont know what's wrong with my ring finger nail, why it's looking so different. 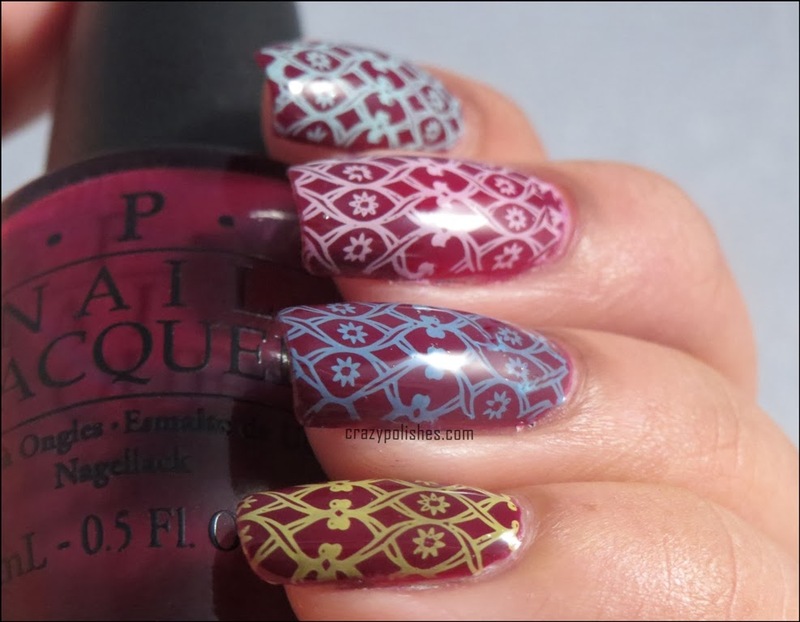 Today's theme is "Same Pattern Different Colors" so I did a stamping manicure with same image stamped with different colors. I love how this manicure turned out, love love the base and all the stamping polishes did very good job.I wasn't sure how well this polishes will stamp on a dark base like this but they look very nice here. Isn't it?? I hope you like this nail art. Please do comment what you think.